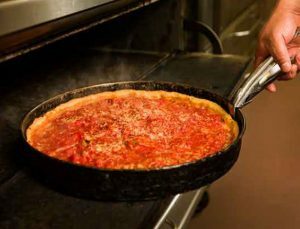 Northwest Indiana residents will have another option for Chicago-style deep-dish pizza. Northbrook, Ill.-based Lou Malnati’s Pizzera announced April 10 it is opening its first Indiana location at 36 Indianapolis Blvd. in Schererville, which is an active retail and restaurant hub. Restaurant operators said the location, which only will offer carry-out, delivery and catering services, will be open this summer. The Schererville Lou Malnati’s will be the company’s 58th location. The company said it plans to hire 35 people to staff its new location. Aside from serving up their famous deep-dish pizza, Lou Malnati’s Pizzeria also provides fundraising and youth incentive programs to local schools and organizations and donates gift cards for raffles and fundraising incentives for approved charitable organizations. Giordano’s, another Chicago-based chain known for its deep-dish pizza, opened in Schererville in fall 2017 at 625 U.S. 30 near Indianapolis Boulevard. It marked a return to the Region for Giordano’s, which had closed its Merrillville location more than a decade ago.